The Catlins are an area of the southern most tip of New Zealand, a rolling mass of green hills, wetlands, waterfalls, forests and beaches that all are pressed by the wind. The wind is what brought me here, that and the affect it has on the trees. Combined together, they create some of the most beautiful scenes of my trip. Gusts of wind stretch the trees to their sides as if in a dance. Their bodies arc inland over years of breezes shaping their form. The morning I left the Catlins, I woke before sunrise and raced along a dirt road in the dark. A bright golden line started forming over the hilltops and between the thick clouds in the upper sky. In the dark, my headlights hit the dirt and farmer’s fences. At one point a mass of white mounds filled a hill with no spaces, moving and rotating like a flock of birds. As I grew closer, I saw they were sheep with their coats unshorn, running around startled by my car, the only movement and sound at this early hour. Arriving at the lighthouse, I saw the ocean, lit by the sliver of gold that gradually grew brighter. The white light house was small in the distance, slowly growing a pale yellow with a path of dirt and tall beach grasses leading up to it. I was drawn to it and then remembered, it wasn’t the light house I was here for, but the trees. A large cluster of them lay down a side path muted in the distance, just beginning to appear in the first morning light. They bent over, making large cave-like rooms underneath, completely blocking the wind and creating a quiet shelter. I passed under and through the largest one, coming out the back and seeing the bent side, exposed by the elements. Each bare trunk leaned with grace, sculpted by time and wind. I walked into the tall grasses to my waist, my foot steps creating the only indents in the sea of long blades. Then I stood facing the grove as the sun rose directly behind it. A burst of yellow and orange lit the sky as the wind blew around me. I was at the end of the world, the only soul awake and viewing this spectacular show. My smile and stance were wide, arms slightly out and fingers splayed in the breeze as if I were a bird about to take flight. It was the most beautiful sunrise of my life and one I’ll never forget. The moment was one where I felt truly in the now, not the past or future, not caught up in a story or plan, but in that very moment, alive with everything going for me. All the things I was grateful for ran through my mind. My family is alive and healthy, I’m young and traveling around the world, my life was coming together in ways I never imagined, and this moment… one of the most beautiful of my lifetime. I walked a little over to one side to take some final photos and let out a big, “WOW!” as the sky lit up even brighter. A few sheep looked up and several ran off as I laughed at their startled reaction to my voice. I started back to the lighthouse and around through dunes and feathery cream grasses blowing in the wind to my little rental car, still the only one in the lot. The Catlins area is a remote place where one realizes wifi and cellphone coverage are non existent and unimportant. The nearest gas station is over an hour away and towns consist of a few buildings with no banks or services besides the random cafe. When you come here, you come seeking the quiet and the only conversations you have are with mother nature. She and I had some great talks, while her beauty and breeze swept my breath away to become one with all that is. 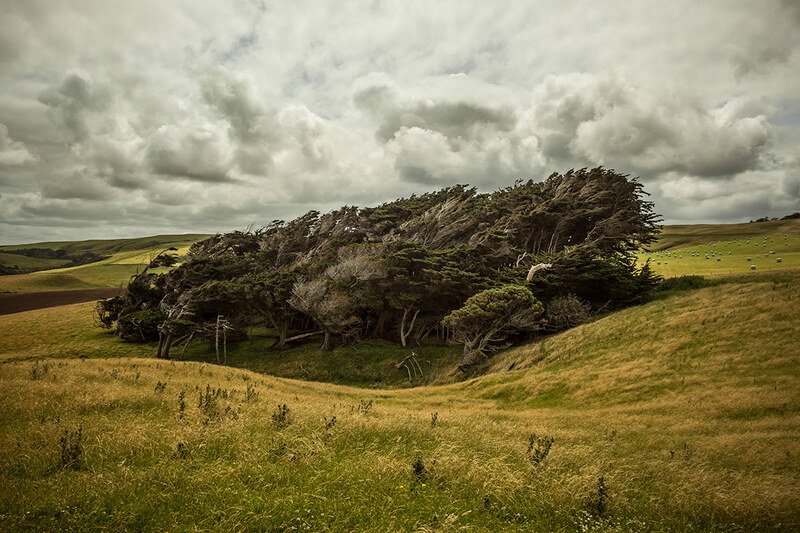 Official website -There are many things to see while visiting the Catlins, from waterfalls to windswept trees, visit this site for more details. Where I stayed: I stayed at a lovely farm near Slope Point, the southernmost tip of New Zealand. It was quiet, safe, clean and comfy. The owner was very nice and helpful. Visit their website here to reserve. Getting around and preparation: It’s best to rent a car to see this area. It is very remote. Bring enough cash with you as there are no ATMs or banks. Fill up your tank with gas often because gas stations are few and far between. Bring music for driving, there aren’t many radio stations that come in clear. You are so lucky to see this. Magnificent photos and description. You are filled with the splendors of your travels. May these feelings never leave your soul! !